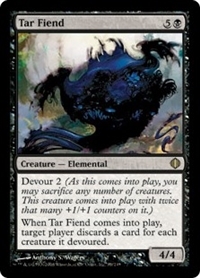 When Tar Fiend enters the battlefield, target player discards a card for each creature it devoured. 10/1/2008 You may choose not to sacrifice any creatures for the Devour ability. 10/1/2008 If you cast this as a spell, you choose how many and which creatures to devour as part of the resolution of that spell. (It can’t be countered at this point.) The same is true of a spell or ability that lets you put a creature with devour onto the battlefield. 10/1/2008 You may sacrifice only creatures that are already on the battlefield. If a creature with devour and another creature are entering the battlefield under your control at the same time, the creature with devour can’t devour that other creature. The creature with devour also can’t devour itself. 10/1/2008 If multiple creatures with devour are entering the battlefield under your control at the same time, you may use each one’s devour ability. A creature you already control can be devoured by only one of them, however. (In other words, you can’t sacrifice the same creature to satisfy multiple devour abilities.) All creatures devoured this way are sacrificed at the same time.